Harry Redknapp says there was "not a good atmosphere" at QPR when he took over from Mark Hughes, who returns to his former club with Stoke on Saturday. Hughes was sacked as Hoops manager in November 2012 after 11 months in the role. Redknapp took over but could not stop relegation to the Championship. "When you go 13 games without a win there has to be something wrong," said the 67-year-old former Tottenham boss. "There wasn't a good atmosphere about the place." 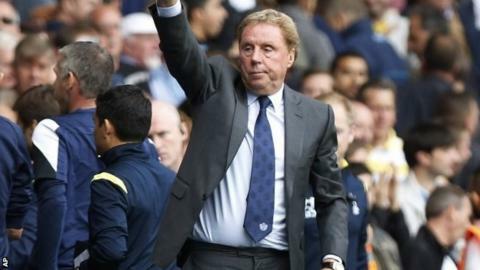 Redknapp, who led QPR back into the Premier League last season, added: "There were lots of different groups at the club. There were the lads who had been here before and played in the Championship and a new group that came in. "It wasn't all down to Mark. He probably inherited some and some had come in. You never get a perfect group. "Now we have a good group of lads and a good atmosphere." Meanwhile, Redknapp questioned the Football Association's suggestion of reducing the number of non-EU players, a plan aimed at encouraging the promotion of home-grown talent in Premier League teams. "As long as the home-grown players are good enough to play at the top level then it's not a problem," he added. "We all want to see more British players playing in the Premier League, but they have to be good enough. "It's no good playing them just for the sake of it. If they are not up to playing then you have a problem."